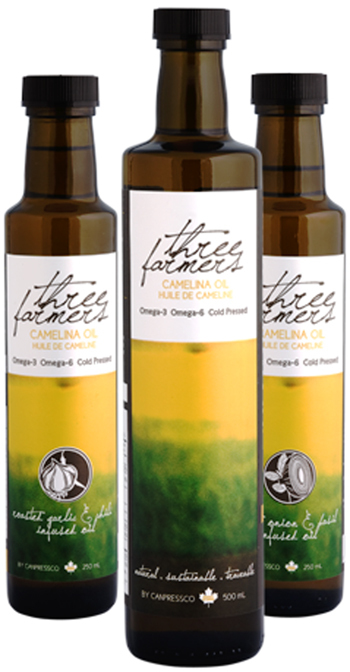 Founded in 2010 by a group of farmers in Saskatchewan, Three Farmers was the first to introduce camelina culinary oil to Canada. Grown with non-GMO seeds, and chemical free processing, the cold pressed oil is high in Omega 3, and Vitamin E. Derived from the camelina sativa plant which is native To Central Asia and Northern Europe, it was popular until the 16th century, before falling out of fashion. With a fresh pea smell and grassy flavour the oil can be heated to high temperatures– great for everyday cooking. Available in three flavours: roasted onion and basil; roasted garlic and chili and traditional in 250ml and 500 ml. Over the holiday season, 100ml three packs will be available.